San Lorenzo's bayshore is part of the Hayward Regional Shoreline. The Newark - San Lorenzo Bay Trail, part of the Bay Trail encircling the entire bay, permits close viewing of representative wildlife habitats up to San Lorenzo Creek, and includes the Shoreline Interpretive Center near Route 92. The San Leandro Bay Trail continues northward, from San Lorenzo Creek to Marina Park and then along San Leandro Bay and Oakland. The Hayward Regional Shoreline is a great place for seeing how the tides affect the bay and the inland marshes. The bayshore changes radically, from wide mudflats at low tide to wave-washed rocky and terraced shores at high tide. On the many bridges in this area you can watch the tide waters rush in and out to feed and drain the sloughs, creeks, and marshes. At low tide the marshes are mudflats, covered with scurrying birds probing in the mud for food. At high tide the marshes are flooded, with birds lazily floating on the surface, wading the shallows, or diving underwater for a meal. Check for today's times of high and low tides near Robert's Landing. At the south end of the shoreline, near Route 92, is the Hayward Shoreline Interpretive Center, operated by the Hayward Area Recreation & Park District. It has permanent and changing exhibits on the shore and marsh environment. There are aquariums, an interactive computer exhibit on the Bay, microscopes, informative videos, and wall murals on bay life. The center also has maps, a gift shop, and restrooms. Outside is an elevated observation platform that provides a good view of the surrounding marshlands. The center is open Fridays, Saturdays, and Sundays, 10 a.m. to 5 p.m., or by appointment (4901 Breakwater Avenue, Hayward, tel. 510.670.7270, e-mail shoreline@haywardrec.org). In 1970 the Hayward Area Shoreline Planning Agency (HASPA) was formed to preserve the bayshore of San Lorenzo and Hayward in its natural state, restore wetlands, and develop recreational uses, such as trails and educational facilities. HASPA is a joint powers agreement between East Bay Regional Park District (EBRPD), Hayward Area Recreation and Park District (HARD), and the City of Hayward (until 2005 the San Lorenzo and Hayward unified school districts were also part of the agreement). HASPA is governed by a board of trustees, which has a technical advisory committee and, until the reorganization of HASPA in January 2017, a citizens advisory committee. HASPA prepared its first proposal for action in 1974. In 1976 it issued a planning program that was revised in 1993. A 1993 brochure, Hayward Area Shoreline Planning Program, describes HASPA's objectives in six areas: environmental protection, historical preservation, education and research, recreational opportunities, industrial development and circulation, and land management. A companion brochure, Hayward Shoreline Environmental Enhancement Program, describes HASPA's recommendations for implementing its environmental protection policies at each site within the agency's jurisdiction. As of January 2017 HASPA was reorganized under a new joint powers agreement. In October 2016 the technical advisory committee recommended that the mission of HASPA be changed; according to a memorandum from the committee, the original goals and objectives of HASPA had all been fulfilled by 2015. The board of trustees agreed that in the future the agency would focus largely on the impact of the rise in sea level on the bay shoreline. Staff support for HASPA rotates among the agency's three members. The Hayward Regional Shoreline extends from the San Lorenzo Creek in the north to Route 92 (the highway to San Mateo Bridge). It is bounded on the east by the Southern Pacific Railroad tracks. Immediately west of the tracks lies a portion of the "industrial corridor" of the City of Hayward. Bayward of this urban development are some 8,500 acres of marshes and former marshes. Of this, 5,100 acres are used as commercial saltwater evaporation ponds; 2,300 acres have been acquired by public agencies; and the remaining 1,100 acres, mostly former salt production lands, are held by private parties. Westerly of the marshland are mud flats and open bay. During high tides the bay waters extend up to the levees along the western limits of the former marsh and into restored marshes that have been reestablished. At low tide the adjacent exposed mud flats can extend westerly for more than a mile. An English sailor, William Roberts, settled in San Lorenzo in l853 and established Roberts Landing at the end of Lewelling Blvd. Roberts Landing, with a long wharf and several warehouses, was the chief link for many years for local farmers to ship grain, fruits, and vegetables to San Francisco. It provided the first easy access to San Francisco markets and helped develop San Lorenzo's agricultural economy well before the coming of the first railroad in l865. It was also a receiving point for Roberts' lumber business. 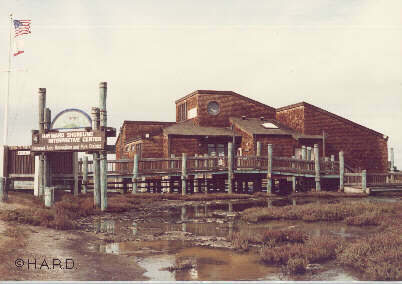 Soon thereafter other commercial wharves were built: Mulford's Landing in San Leandro, and Hayward's Landing in Hayward at the end of presentday Winton Avenue. These "landings" are still noted on maps. Today, remnants of wharf timbers protrude from the mudflats at low tide and are visible from the shoreline trail. In 1854 John Johnson built levees in the local salt marshes to create the first commercial salt production ponds on San Francisco Bay. In those days salt was used for food preservation and silver mining. These salt evaporation ponds eventually occupied vast tracts of tideland, complete with a rail system for collecting salt. Today the acreage of tidelands devoted to salt production has been significantly reduced. The Hayward Shoreline marsh restoration project is one of the largest of its kind on the West Coast, comprising 400 acres of salt, brackish, and freshwater marshes. The Cogswell Marsh, the first phase of the project, was completed in 1980 when the northern 250 acres of the 400 acre site was prepared and restored to tidal action by extensive grading and breaching of dikes. This area is rapidly becoming an established saltwater marsh. The second phase of the project involved restoration of 145 acres of land to fresh and brackish marshes, using existing and newly created channels and dikes to form a five-basin marsh system. The project site is located immediately south of and adjacent to Cogswell Marsh. The fresh and brackish water marsh system is somewhat unusual in that it relies on secondary treated wastewater as the source of freshwater. Flow through the five basins is controlled by a series of weirs, valves, and channels, allowing for great flexibility in operation, management, and research opportunities. Each year hundreds of thousands of birds migrate along the Pacific Flyway using the Hayward Shoreline and adjacent areas as vitally important feeding and resting areas. Some fly through the area in spring and fall, while others stay to winter in the shelter of the bay. In addition, the shoreline has a permanent, year-round population of birds. These soft-bottom areas contain minerals and sediments that are continually deposited, as well as degraded organic materials. They provide suitable habitat and an abundance of food for a vast array of invertebrates, fish, and shorebirds. These areas provide some of the most productive habitats in the bay region. The marshes extend upward from the mudflats and tidal channels and slough and are dominated by pickleweed (Salicornia), with other types of plants interspersed at various tidal levels. The outer, lower-tidal edges of the marshes contain cordgrass (Spartina) and the horse mussel (Ischadium), both of which stabilize the sediments and are important food sources. The cordgrass and pickleweed marshes provide habitats for small invertebrates (both aquatic and land-based) and various species of birds and small mammals. The marsh channels and edges serve as nursery grounds for shellfish and fish. They also provide a habitat for rare and endangered species, such as the salt marsh harvest mouse, clapper rail, and a subspecies of the song sparrow. These ponds receive water from natural drainage or pumped water (including treated sewage effluent). They provide a scarce and essential source of freshwater for wildlife. Although the freshwater ponds support a broad range of animal types, the abundance of waterfowl dominates. Plants on the fringes include sedges, bulrush, cattails, and other low salt-tolerant species. These nontidal wetlands provide habitat for a variety of aquatic birds and other marsh inhabitants. The soils typically have a high salt content and are dominated by pickleweed. These wetlands can be reestablished as brackish or salt marshes. Seasonal wetlands occur between terrestrial and aquatic systems, where the water table is usually at or near the surface and the land is, at least periodically, covered by shallow water. Along the Hayward Regional Shoreline, seasonal wetlands occur at varying elevations, involve a vareity of soil types and soil salinities, and support a variety of resident plants and animals. They provide a habitat for aquatic and terrestrial invertebrates, feeding, roosting, and nesting birds, and an assortment of small mammals, including the salt marsh harvest mouse. They also provide important feeding and resting areas for the thousands of waterfowl that stop during migration along the Pacific Flyway. Uplands in the Hayward Regional Shoreline include levees, man-made islands, farmlands, and former solid-waste disposal sites that can be sealed and replanted as man-made habitat. These sites not only provide habitat for upland species, they also provide roosting and nesting sites for waterfowl, and refuge for small mammals. There are three access points to the Hayward Regional Shoreline. The southernmost point can be reached from the East Bay by taking Interstate 880 to Route 92 west to the Clawiter Road/Eden Landing Road exit, just east of the San Mateo-Hayward Bridge toll plaza. From the Peninsula cross the San Mateo-Hayward Bridge east, take the Clawiter Road/Eden Landing Road exit, turn left and cross over the highway. Cross Clawiter. Turn left on Breakwater Avenue, which curves to the right to parallel Route 92. Near the end of Breakwater Avenue is the Hayward Shoreline Interpretive Center. The Hayward Shoreline Bay Trail starts here. The middle point, which includes the park office, is off West Winton Avenue. Take Interstate 880 to the Winton Avenue exit. Head west on West Winton Avenue to the parking lot at the end of the road. The trail begins on either side of the flood control channel. The northernmost point is at Grant Avenue in San Lorenzo. Take Interstate 880 to the Washington Avenue exit. Take Washington Avenue south, then turn right on Grant Avenue. Follow Grant west. The parking lot is on the right side of the road, just before it deadends. 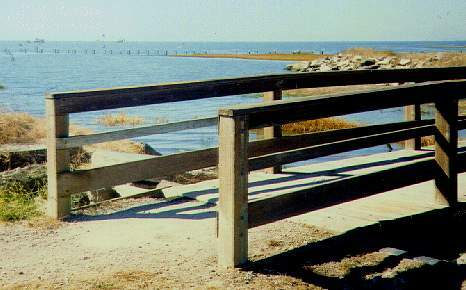 The northern end of the Hayward Regional Shoreline can also be reached from the San Leandro Bay Trail, which crosses the San Lorenzo Creek by bridge.